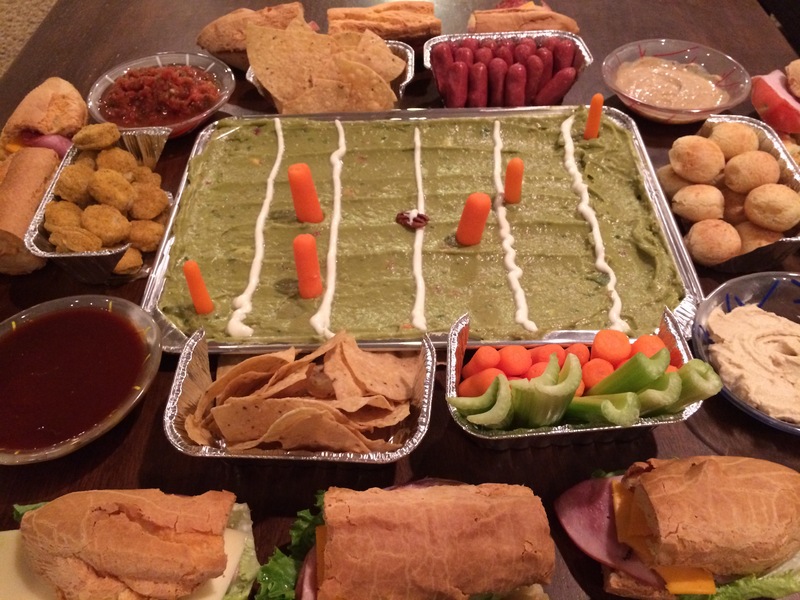 I don’t know much about the pigskin, but I know a lot about junk food and that people apparently enjoy it in spades during the Super Bowl football game. That’s right, yes? I discovered how epic Super Bowl snacks could actually be during my day job as an editor at Mom.me when Pillsbury introduced me to the Snackadium. Amazing, isn’t it? Of course I was also filled with a jealousy as intense as a thousand suns, and you know what happens when I get jealous. I commandeer that shizzle and make it my own. These guys were pretty stoked about it, too. This is much easier than you might think, so don’t go giving me some kind of crazy credit for this monstrosity. Although if you see me out, a high-five might be in order. The only materials you’re going to need are six disposable mini-loaf pans, and a disposable cookie sheet (they’re smaller than normal cookie sheets). And four bowls, square glass containers, or whatever you have on hand. Then you just fill this stadium up! Here’s what I threw in the stands and on the field, and up in the nosebleed seats. The Field: It’s guacamole! That is all. The Pillsbury people also suggest a pizza with pepperoni shaped like a football, which I also like. But I just slopped that guac (about 5 cups) evenly on the disposable cookie sheet then created sour cream field lines (is that what they call them?) with a Ziploc bag with a corner nipped off. The carrots are the football players and my kids insisted I use a pecan (also with sour cream, ummm, yuck) as the football. This is basically the center that holds it all together. The bleachers: You take your scissors to the mini loaf pans and cut towards both smaller sides at an angle, as if you’re creating stairs that you climb up to get to your seats, then you fold down the front side and cut it off to open that stadium seating up. Fill up the stands! I used Applegate gluten-free chicken nuggets because I especially thought they looked like little people. Those, and the Brazi Bites with bacon on the opposing team bookend a football field quite nicely. Of course you’re going to need tortilla chips for your field of guacamole, so do that. Then find some gluten-free Lil’ Smokey like weiners. I lost the package here, so I cannot recall the brand (it wasn’t one of the usual suspects, but Applegate does make them and they rock). If you want to pretend you’re healthy snacking, line up the celery and baby carrots (tall guys in back!). The 4 corners: This is where you put your dips. Preferably you’ve got four square dip holders, but you can also use bowls. You’re going to want some hummus for the veggies, some gluten-free BBQ sauce and gluten-free hot mustard for your Lil’ Smokeys, and some salsa for the chips. YUM. The nosebleed seats: This is where you get crazy making sandwiches! I grabbed some gluten-free baguettes from Against The Grain. They just seem the most normal, right? 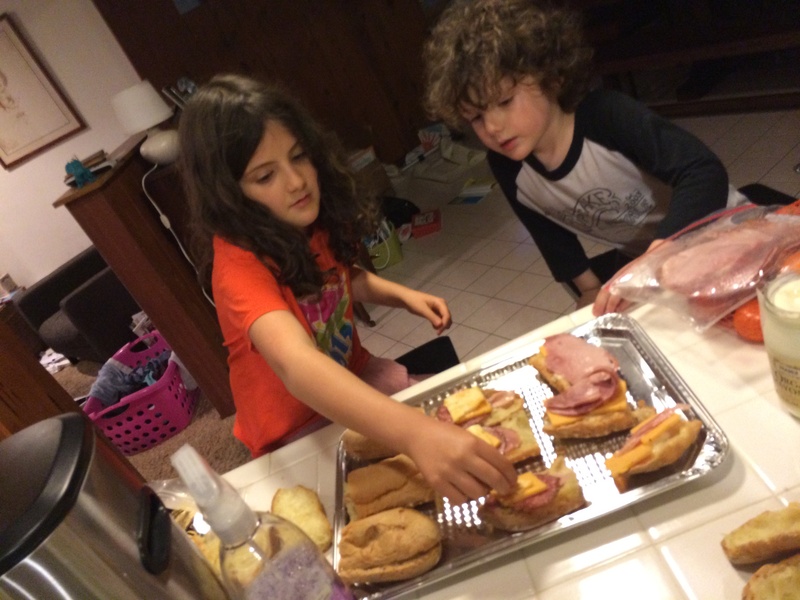 I employed some child labor to assemble the sandwiches and we all chose what we wanted on our section of sandwiches. And you’re done! Of course, I realized that was way too large of a dinner for a family of four. It really is something that should only be pulled out for Super Bowl parties and the like. Or as my husband said, “You’re making this for ALL the parties.” So either/or. Go Your Team of Choice! 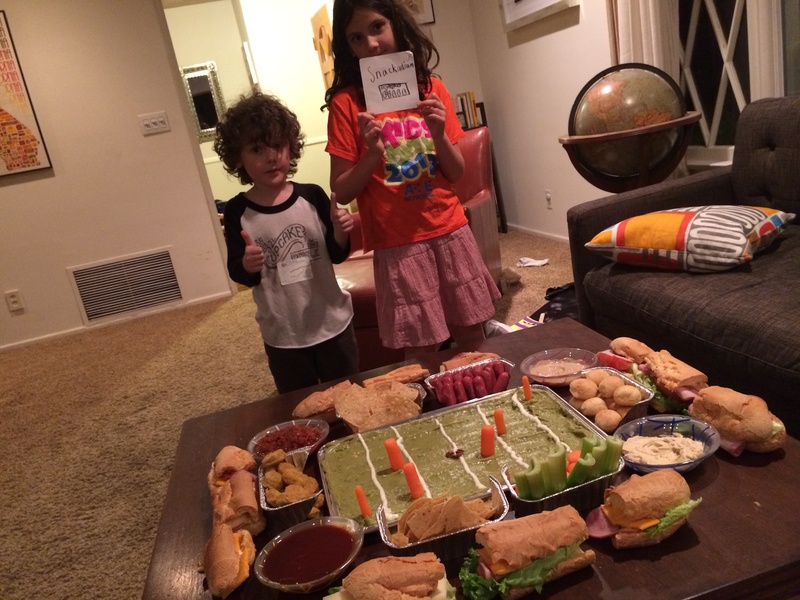 Tags: gluten-free appetizers, gluten-free party, gluten-free snackadium, gluten-free super bowl snacks. Bookmark the permalink. Previous post ← Gluten-Free Palm Springs: Cheeky’s, Lulu, Trio & More! Hooray for sports! I just went over to Against the Grain, and sent them an email asking about distribution in Canada. I cannot tell you the need I have for baguette – it’s a bit nuts. Your spread looks great (as always)! Yes, baguettes, bagels, croissants, and brioche all need to be perfected – stat. Great article, thanks. Where in L.A. did you get the baguettes? Whole Foods? Yes, Whole Foods. Pam McD’s in Burbank also has even more of a baguette selection.